The "Nord Modular G2 series - Vol. 01. 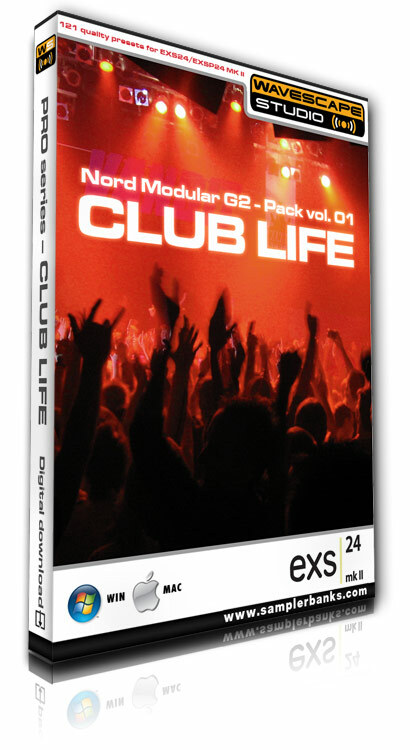 - CLUB LIFE" is a set of 113 magnificent multi-sampled and categorized instrument using all the great features of your EXS-EXSP24 MK II sampler. Shaking basses, dark pads and swirling arpeggios, cutting-edge leads are all there to add a distinctive character, to make your mind blowing and your production shine. Sampler presets in this pack went through a multiple selection process, so 113 real club sounds were selected from many hundreds. Some of them contain massive layers creating really FAT sounds - just check the XTRA category! We categorized each presets into ARP, BASS, LEAD, PAD, XTRA categories for easier identification while looking for the right sound for your song in the making.